Not to be confused with Army of Islam (Gaza Strip) or Islamic Army in Iraq. Jaysh al-Islam (Arabic: جيش الإسلام‎, meaning Army of Islam), formerly known as Liwa al-Islam (Arabic: لواء الإسلام‎, Brigade of Islam), is a coalition of Islamist rebel units involved in the Syrian Civil War. Its primary base of operations was the Damascus area, particularly the city of Douma and the rest of the region of Eastern Ghouta, where Jaysh al-Islam was the largest rebel faction, as was Liwa al-Islam before. The group was part of the Free Syrian Army's Supreme Military Council until December 2013, but in November 2013 started the Syrian Islamic Front and the next month broke with the SMC and the Free Syrian Army. The group along with Ahrar ash-Sham are among the main rebel groups supported by Saudi Arabia. Having previously promoted an Islamic state under Sharia law, since 2015, Jaysh al-Islam has called for the Syrian government to be replaced by a technocratic body that represents the diversity of the Syrian people. Liwa al-Islam was established by Zahran Alloush, the son of Saudi-based religious scholar Abdullah Mohammed Alloush, after Syrian authorities released him from prison in mid-2011, where he had been serving time for his Salafist activism. The group claimed responsibility for carrying out the July 2012 Damascus bombing that killed Defense Minister Dawoud Rajiha, Deputy Defense Minister Asef Shawkat, and Assistant Vice President Hassan Turkmani. Liwa al-Islam was a driving force behind actions in the Damascus region. It cooperated and conducted joint operations with the al-Nusra Front. On 29 September 2013, 50 rebel factions operating mostly around Damascus announced their merger into a new group called Jaysh al-Islam. Liwa al-Islam was the dominant faction in this merger, and its leader Zahran Alloush was announced as the leader of Jaysh al-Islam. Thirty-eight of the original groups listed as joining the merger were already members of, or affiliated with, Liwa al Islam. In September or earlier, Jaysh' spokesman Islam Alloush had criticized the Syrian National Coalition, stating that the SNC should be led by those who are fighting in Syria rather than leaders in exile, but felt not (yet) inclined to outright break with the SNC. By November 2013, 60 groups had merged into Jaysh al-Islam, and more than 175 rebel groups around Syria expressed a desire to join it. The new group's creation was said to have been negotiated and spearheaded by Saudi Arabia, who believed that al-Nusra Front was gaining too much strength. After the merger, The Guardian reported that Saudi Arabia was preparing to give the group millions of dollars to "arm and train" its fighters, and use instructors from Pakistan to help train the group. While previously having been part of the Free Syrian Army's Supreme Military Council (SMC), in December 2013 Zahran Alloush announced his departure from that SMC, saying: "our affiliation to the Council came when it was coordinating operations against the Assad regime without being dependent on any other party, and when it had signed no pledges as to the makeup of a future state. However, when the FSA had come under the aegis of the Syrian National Coalition (in October 2013) which was committed to a democratic, pluralist state, Alloush – who had started the new Syrian Islamic Front of Islamist factions in November 2013 – decided he would no longer be part of the Supreme Military Council. On 26 April 2015, they established the Fatah Halab joint operations room along with other major Aleppo based groups. Until late 2015, Jaysh al-Islam at times cooperated with the Al-Nusra Front. On 25 December 2015, the group's founder Zahran Alloush was killed, along with several other leaders of the group, in a Syrian air strike on the suburbs of Damascus. Abu Hammam Bouwaidani succeeded him as leader. 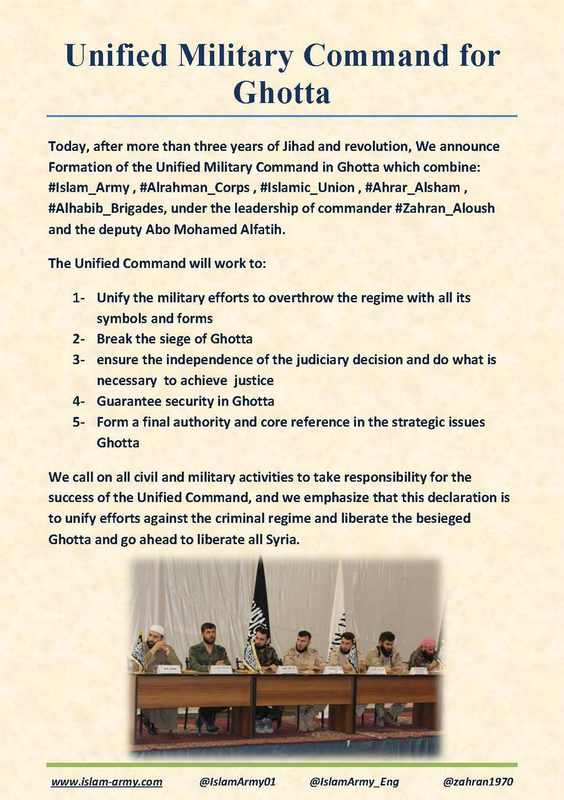 Since the death of Zahran Alloush late 2015, there have been conflicts between Jaysh al-Islam and other members of the Unified Military Command of Eastern Ghouta, along with associated groups such as Al-Nusra Front and its Jaish Al-Fustat operations room. Ahrar ash-Sham have remained neutral. Intra-rebel fighting in Ghouta took place in May 2016, with 300 deaths. On 24 May 2016, leaders of Jaysh al-Islam and al-Rahman Legion met to sign a peace deal to end hostilities. On 25 January 2017, Jaysh al-Islam's Idlib branch joined Ahrar al-Sham. In April 2017 a coalition of the Al-Rahman Legion and Tahrir al-Sham encroached on the area of Eastern Ghouta controlled by Jaysh, which launched a campaign to drive them out, resulting in 95 casualties between 26 April and 1 May. The clashes enabled the Syrian Army to make advances in eastern Damascus. Demonstrators called for an end to the fighting; video footage circulated at the end of April appeared to show Jaysh al-Islam fighters opening fire on demonstrators who called for an end to the rebel infighting. On 12 April 2018, some 13,000 Jaysh al-Islam fighters with their families have evacuated the town of Douma in buses, thus surrendering that town to the Assad government. Jaysh fighters and their families have resettled in northern Syria, in the Aleppo countryside, where they operate under the Turkish-backed National Army. Since 2015, Jaysh al-Islam has called for the Syrian government to be replaced by a technocratic body that represents the diversity of the Syrian people. Zahran Alloush initially called for the establishment of an Islamic state in Syria but later renounced his previous positions, expressed support for an elected government, boasted about the protection his organization offers to Christians under its rule and even defined the Alawi sect as a victim of the Assad regime. As an example of the earlier sectarianism, in 2013 or earlier, Alloush in a speech suggested that "Sham" or Bilad al-Sham (the Levant or specifically Damascus) should be "cleansed of the filth" of the Shi'ites (whom he called "Rafida" = rejectionists) and Alawites (whom he called "Nusayris" or "Majous" = Zoroastrians, pre-Islamic Persians): "And I give you the news, oh unclean Rafida: Just as the Umayyads crushed your heads in the past, the people of Ghouta and Sham will crush them soon, they will make you taste a painful torment in this world, before God makes you taste it in the hereafter". In that early period, Alloush denounced democracy and called for an Islamic state to succeed Assad. However, in a May 2015 interview with McClatchy journalists, Alloush used more moderate rhetoric, claiming that Syrians should decide what sort of state they wanted to live under and that Alawites were "part of the Syrian people" and only those with blood on their hands should be held accountable. His spokesman went on to claim that the sectarian and Islamist rhetoric Alloush had previously made was only intended for internal consumption and to rally his fighters. On 6 October 2012, Liwa al-Islam captured two 9K33 Osa SAM systems in Eastern Ghouta with at least 12 missiles total. [better source needed] A video was posted on 29 July 2013, depicting some of the missiles being used to shoot down a Syrian government Mil Mi-8. In November 2013, the group captured two training-jets (L-39s used by the government as jet fighters) from the Syrian Air Force and showed them on the runway. But so far, they haven't been used in combat. In March 2016, Syria Deeply reported: "...the leader of Jaish al-Islam, or "Army of Islam" was killed in December last year in a government air strike. His death, however, did nothing to stop to the group's totalitarian rule in Eastern Ghouta, where residents say torture and imprisonment without trial occur routinely in the name of "liberation" and Sharia law." From approximately January 2014 until July 2015, Jaysh was fiercely fighting ISIL, especially in the Ghouta belt around Damascus. In revenge for ISIL's beheading of Jaysh members and releasing a video recording of the event in June 2015, Jaysh al-Islam's website published a video that showed its fighters executing 18 alleged ISIL militants by shotgun. The video mimics the imagery that ISIL has used for similar filmed executions; however, it reversed the imagery by having the executioners wearing orange prisoner outfits and the victims being dressed in black robes. The video included some English subtitles. In August and September 2015, Jaysh al-Islam shelled and stormed Adra Prison in north-east Damascus. As of 12 September 2015, it had taken control of two buildings. On 1 November 2015, an opposition media outlet, Shaam News Network, posted a video showing Jaysh al-Islam militants had locked people in cages and spread out 100 cages containing about 7 captives each through Eastern Ghouta, northeast of Damascus, to use them as human shields against Syrian government air raids. According to the Syrian Observatory for Human Rights, the caged people being used as human shields were captured Alawite military officers and their families who had been kidnapped by Jaysh al-Islam two years ago outside Adra al-Ummaliyah, a government-held neighbourhood in Eastern Ghouta. However, Jaysh al-Islam has not yet claimed responsibility for either of these alleged actions and The New York Times has suggested the possibility that these 'hostages on public display' were a mere show, to sway public opinion against further government and Russian bombardments on Eastern Ghouta. On 7 April 2016, the Sheikh Maqsood neighborhood in Aleppo was shelled with mortars that may have contained chemical agents. On 8 April, a spokesman for the rebel group said that "weapons not authorized for use in these types of confrontations" had been used against Kurdish militia and civilians in Aleppo. He stated that "One of our commanders has unlawfully used a type of weapon that is not included in our list". He did not specify what substances were used but, according to Kurdish Red Crescent, the symptoms were consistent with the use of chlorine gas or other agents. Welat Memo, a physician with the Kurdish Red Crescent, said that the people affected are "vomiting and having difficulty in breathing." Spokesperson for the Kurdish People's Protection Units (YPG) said that Jaysh al-Islam's "statement came after many conclusive evidences and reports of chemical gas being used in shelling Aleppo's Sheikh Maqsoud district". He also said that the group has attacked the Kurdish neighborhood of Aleppo with "forbidden weapons" many times since the war's start. Jaysh al-Islam subsequently clarified that it was referring to "modified Grad rockets," not chemical weapons. Stanford University's Mapping Militant Organizations project records that Jaysh al-Islam is not designated as a terrorist organization by any major national government or international body. However, it notes that Russia, Lebanon, and Egypt have supported classifying it as such since the end of 2015. Later, however, JaI was designated "moderate opposition" in a December 2016 list released by the Russian defence ministry, and participated in the Russian-backed Astana talks. Jaysh al-Islam's relationship with the United States has remained mixed, though the group has been generally supportive of the U.S. presence in Syria. The group has praised the U.S. for its airstrikes against the Syrian government, but has criticized it over the scale of the strikes and has called for heavier military action by the US against the Syrian government. [better source needed] Former U.S. Secretary of State John Kerry, in a speech in Aspen, Colorado on 28 June 2016, mentioned Jaysh al-Islam and Ahrar al-Sham as "subgroups" of "the terrorists" ISIL and Jabhat al-Nusra. US Obama administration officials disapproved this mention and told The Washington Post, who speculated that Kerry's comment may have been accidental, that it was inaccurate and could harm U.S. government efforts to convince the Russian and the Syrian governments not to attack Jaysh al-Islam and Ahrar al-Sham. The Post also reported that "Syrian [opposition] groups" saw Kerry's comments as an example of how the Obama administration has slowly moved toward the Russian view of Syria, which includes painting all opposition groups as terrorist organizations in order to justify attacking them. The US State Department in July 2016 confirmed that the US administration's policy with regard to Jaysh al-Islam had not changed: Jaysh was and is not a UN-designated terrorist group, is opposed to ISIL, and is not allied to Nusra. ^ Not to be confused with the Damascus Military Council which also had the same name. ^ a b c "Syria crisis: Saudi Arabia to spend millions to train new rebel force". The Guardian. 7 November 2013. Archived from the original on 10 November 2013. Retrieved 10 November 2013. ^ a b c d "Insight: Saudi Arabia boosts Salafist rivals to al Qaeda in Syria". Reuters. 1 October 2013. Retrieved 8 May 2015. ^ a b Elizabeth Tsurkov (26 August 2016). "Jaish al-Islam: Rebels at the Gates of Damascus". Forum for Regional Thinking. Archived from the original on 1 September 2017. ^ "50 officers graduated from the Military Academy at its first East Balgoth". All4Syria. 14 July 2017. Archived from the original on 14 July 2017. ^ a b "Jaysh Usud al-Sharqiya: Exiles of the Euphrates - bellingcat". 17 April 2017. Archived from the original on 19 April 2017. ^ Army Of Islam (10 June 2017). "#Damascus_countryside Jaish al Islam ...A field walk by the leader of 7th group, Abu Anas, to check the front of Eastern Qalamoun.pic.twitter.com/kiPpIz9WIr". Twitter. Archived from the original on 1 October 2017. ^ "Syrian Army exterminates prominent Jaish al-Islam commander". Al-Masdar. 17 April 2017. Archived from the original on 20 May 2017. ^ a b c O'Bagy, Elizabeth (24 March 2013). "The Free Syrian Army" (PDF). Institute for the Study of War. Archived (PDF) from the original on 27 March 2014. Retrieved 10 November 2013. ^ Kareem Shaheen and Agencies (25 December 2015). "Leader of powerful Syrian rebel group killed in airstrike". The Guardian. Archived from the original on 26 January 2016. ^ Ahmad Zakariyah (16 March 2017). "FSA Commanders confirm the Syrian revolution will continue until achieving its goals". RFS Media Office. ^ Lister 2015, p. 344. ^ "Syria conflict: Islamist rebel named opposition chief negotiator". BBC News. 20 January 2016. Archived from the original on 24 February 2016. Retrieved 24 February 2016. ^ Lister 2015, p. 168. ^ Ridha, Hassan (2 June 2017). "Former Jaish al-Islam spokesperson officially leaves group and returns to using his real name "Majdi Mustafa Na'meh"https://twitter.com/sayed_ridha/status/870639840219373568 …". Archived from the original on 5 March 2018. ^ a b "Rise of Jaish al-Islam marks a turn in Syria conflict". Middle East Eye. 7 May 2015. Archived from the original on 9 May 2015. Retrieved 8 May 2015. ^ "Syria conflict: Essam al-Buwaydhani named leader of rebel group Army of Islam". International Business Times. 26 December 2015. Archived from the original on 17 January 2016. Retrieved 26 December 2015. ^ "عملية تبادل أسرى لدى عصابات الأسد في جنوب دمشق". Archived from the original on 1 September 2017. ^ Barić, Joško (12 July 2017). "Syrian War Daily – 12th of July 2017". Archived from the original on 1 September 2017. ^ "Jaysh al-Islam militants completing pullout from southern Damascus". Al Masdar News. 7 May 2018. ^ "The Army of Islam: Militant group battling ISIS and the Syrian regime show their might in 'graduation ceremony' featuring 1,700 soldiers and a fleet of armoured tanks". Daily Mail. 30 April 2015. Archived from the original on 22 September 2015. Retrieved 4 July 2015. ^ "List of armed formations, which joined the ceasefire in the Syrian Arab Republic on December 30, 2016". Ministry of Defence of the Russian Federation. Archived from the original on 30 December 2016. Retrieved 30 December 2016. ^ a b "The Dawn of Freedom Brigades: Analysis and Interview". 2 October 2014. Archived from the original on 10 June 2016. Retrieved 14 June 2016. ^ a b Lund, Aron. "Islamist Mergers in Syria: Ahrar al-Sham Swallows Suqour al-Sham". Archived from the original on 22 March 2016. Retrieved 14 June 2016. ^ a b "Leading Syrian rebel groups form new Islamic Front". BBC. 22 November 2013. Archived from the original on 25 January 2014. Retrieved 22 November 2013. ^ "New Syrian jihadist body formed to fight ISIS". Al Monitor. 28 May 2014. Archived from the original on 6 June 2014. Retrieved 3 June 2014. ^ "Translation: the Formation of the Syrian Revolutionary Command Council". Goha's Nail. 3 August 2014. Archived from the original on 14 August 2014. Retrieved 6 August 2014. ^ "The wars of the Eastern Ghouta grind on". The Daily Star Newspaper - Lebanon. Archived from the original on 16 July 2015. ^ Orango, Tim (12 October 2015). "Deadly Ankara Attack Not Enough to Unify a Polarized Turkey". The New York Times. Archived from the original on 12 October 2015. Retrieved 13 October 2015. ^ "No regime offensive in Qalamoun, rebel official claims". NOW News. 18 November 2013. Archived from the original on 16 December 2013. Retrieved 19 November 2013. ^ Aron Lund (24 September 2013). "New Islamist Bloc Declares Opposition to National Coalition and US Strategy". Syria Comment. Archived from the original on 20 November 2013. Retrieved 7 November 2013. ^ a b "Dissatisfaction between civilians of eastern Aleppo after an attack by Fateh al-Sham on rebel warehouses". SOHR. Archived from the original on 7 December 2016. ^ "ISIL militants.. on way to Damascus". ARA News. 10 July 2014. Archived from the original on 14 July 2014. Retrieved 10 July 2014. ^ "Jaysh Al-Islam Terrorists Admit to Attacking Kurds With Chemical Weapons". Sputnik. Archived from the original on 31 May 2016. Retrieved 14 June 2016. ^ "Jihadists of ISIS and Qaeda attack Syrian rebels in Damascus". ARA News. 3 April 2015. Archived from the original on 5 April 2015. Retrieved 2 April 2015. ^ Jocelyn, Thomas (23 April 2015). "Al Nusrah Front, allies launch new offensives against Syrian regime". Long War Journal. Archived from the original on 28 April 2015. ^ "Syria army 'tightens siege of rebel bastion near Damascus'". AFP. 3 May 2015. Archived from the original on 18 May 2015. Retrieved 11 May 2015. ^ "Largest Syrian rebel groups form Islamic alliance, in possible blow to U.S. influence". Washington Post. 25 September 2013. Archived from the original on 26 September 2013. Retrieved 7 November 2013. ^ a b "Leading Syrian rebels defect, dealing blow to fight against al-Qaeda". Daily Telegraph. 5 December 2013. Archived from the original on 6 December 2013. Retrieved 5 December 2013. ^ "REPORT The Road to a Syria Peace Deal Runs Through Russia". Foreign Policy. Archived from the original on 14 February 2016. Retrieved 14 February 2016. ^ "THE SYRIAN OPPOSITION'S POLITICAL DEMANDS". Institute for Study of War. ^ a b c d "MAPPING MILITANT ORGANIZATIONS: Jaish al-Islam". Stanford University. 31 August 2017. Retrieved 5 March 2018. ^ Aron Lund (17 June 2013). "Freedom fighters? Cannibals? The truth about Syria's rebels". The Independent. Archived from the original on 5 October 2013. Retrieved 7 November 2013. ^ "The Army of Islam Is Winning in Syria". Foreign Policy Magazine. 1 October 2013. Archived from the original on 16 May 2015. Retrieved 8 May 2015. ^ "Total of 43 Islamist Groups Unite under Newly Formed "Army of Islam" in Syria". YouTube. 29 September 2013. Archived from the original on 10 October 2013. Retrieved 7 November 2013. ^ "Assessing Syria's Islamic Alliance". Revolution Observer. 11 October 2013. Retrieved 11 November 2013. ^ "GUEST POST: On Liwa al-Islam and the new 'Jaysh al-Islam' merger". Pundicity. 30 September 2013. Archived from the original on 30 September 2013. Retrieved 11 November 2013. ^ a b "Syria: Jaysh Al-Islam rejects Geneva II conference". Asharq Al-Awsat. 12 November 2013. Archived from the original on 15 November 2013. Retrieved 15 November 2013. ^ "Saudi Arabia's Shadow War". Foreign Policy. 6 November 2013. Archived from the original on 9 November 2013. Retrieved 10 November 2013. ^ "Formation of a "military council in Damascus and its suburbs" and joining the "unified leadership"". Al-Souria. 30 March 2015. Archived from the original on 9 October 2017. ^ Why Jaish Al Islam and Ahrar Al Sham are at the heart of Geneva squabbles. The National. 3 February 2016. ^ "Syrian rebel leaders 'die in air strike'". BBC News. Retrieved 25 December 2015. ^ Kareem Shaheen (25 December 2015). "Leader of powerful Syrian rebel group killed in airstrike". The Guardian. Retrieved 24 January 2016. ^ "Russian raids kill prominent Syrian rebel commander". Al-Jazeera. 25 December 2015. Retrieved 25 December 2015. ^ "Is Jabhat al-Nusra behind Ghouta demonstrations?". 3 July 2015. Retrieved 14 June 2016. ^ Lund, Aron. "After Zahran: Rising Tension in the East Ghouta". Retrieved 14 June 2016. ^ "Rebel allies fight each other in east Damascus: monitor". Retrieved 14 June 2016. ^ Szakola, Albin. "Rebel heavyweights clash outside Damascus". Retrieved 14 June 2016. ^ "Elijah J. Magnier on Twitter". Retrieved 14 June 2016. ^ "Charles Lister on Twitter". Retrieved 14 June 2016. ^ "هادي العبدالله Hadi on Twitter". Archived from the original on 5 February 2017. ^ a b "Syrian rebels 'fire on protesters' calling for end to infighting". Middle East Eye. 1 May 2017. ^ ARD's Tagesschau – the main television news bulletin of Germany, 12 April 2018, 20:00 o'clock, German time. ^ Ashawi, Khalil (29 September 2018). "Far from home, a Syrian rebel group starts over". U.S. Retrieved 16 February 2019. ^ Joshua Landis. "Zahran Alloush: His Ideology and Beliefs". Archived from the original on 25 March 2016. Retrieved 31 March 2016. ^ "Islamist rebel leader walks back rhetoric in first interview with Western media". 20 May 2015. Archived from the original on 25 May 2015. Retrieved 25 May 2015. ^ Syrian Rebel Leader Changes His Conservative Rhetoric in First Talk With an American Newspaper. YouTube. 22 May 2015. Archived from the original on 10 March 2016. Retrieved 19 August 2015. ^ "Syria Comment » Archives "Is Zahran Alloush in Amman?" by Aron Lund - Syria Comment". Syria Comment. Archived from the original on 18 August 2015. Retrieved 19 August 2015. ^ Liwa al-Islam and her 9K33 Osa 31 July 2013. Retrieved 27 December 2013. ^ Video of 9K33 Osa shooting down SAF helicopter. Archived 13 February 2017 at the Wayback Machine[better source needed] Retrieved 27 December 2013. ^ "Islamist rebel air force takes off in Syria". Times of Israel. 3 November 2013. Archived from the original on 28 November 2013. Retrieved 19 November 2013. ^ "Youmna al-Dimashqi (Syria Deeply) Syrians Describe Horrific Torture In Jails Run By Islamist Militants". The Huffington Post. 23 March 2016. ^ a b "Syrian rebels filmed shooting Islamic State militants". BBC News. 1 July 2015. Retrieved 1 July 2015. ^ "Insurgents shell main prison near Syrian capital, killing 10". The Daily Star. 23 August 2015. Archived from the original on 25 August 2015. ^ "11 dead in rebel shelling on Damascus: activists". The Daily Star. 12 September 2015. Archived from the original on 12 September 2015. ^ "Rebels storm Syria's largest prison near Damascus: monitor". 11 September 2015. Archived from the original on 5 October 2015. ^ a b c Robert Mackey, Maher Samaan (1 November 2015). "Caged Hostages From Syrian President's Sect Paraded Through Rebel-Held Suburb". The New York Times. Archived from the original on 4 November 2015. Retrieved 2 November 2015. ^ a b "Monitor: Syria rebels using caged captives as 'human shields'". Al-Arabiya Network. 1 November 2015. Archived from the original on 3 November 2015. Retrieved 2 November 2015. ^ a b "Middle East Concerns grow about abuses, war crimes in Syria". Deutsche Welle. 25 May 2016. ^ "Syrian Islamist group Jaysh al-Islam admits using banned weapons against Kurds in Aleppo". RT. 7 April 2016. Archived from the original on 7 April 2016. ^ "Kurdish Officials: Rebels May Have Used Chemicals in Aleppo". Voice of America. Archived from the original on 11 April 2016. Retrieved 11 April 2016. ^ "Syrian rebels admit chemical use against Kurds". Kurdistan 24. 9 April 2016. ^ Petkova, Mariya (1 March 2018). "Where is al-Qaeda in Syria?". Al Jazeera. Retrieved 15 November 2018. ^ "List of armed formations, which joined the ceasefire in the Syrian Arab Republic on December 30, 2016 : Ministry of Defence of the Russian Federation". MoD Russa. 30 December 2016. Retrieved 15 November 2018. ^ "Syrian war: All you need to know about the Astana talks". Al Jazeera. 29 October 2017. Retrieved 15 November 2018. ^ SouthFromt blog (14 April 2018). "Jaysh Al-Islam Leader Criticizes Scale of US Strike on Syria". Mint Press News. Retrieved 8 May 2018. ^ "Kerry touts the Russian line on Syrian rebel groups". Archived from the original on 3 October 2016. Retrieved 4 September 2016. Lister, Charles R. (2015). The Syrian Jihad: Al-Qaeda, the Islamic State and the Evolution of an Insurgency. Oxford University Press. ISBN 978-019046247-5.